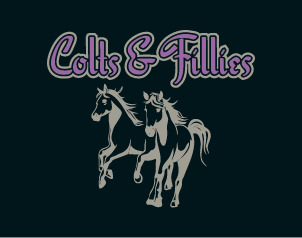 COLTS & FILLIES apparel is now available to order online! VERY IMPORTANT: ALL ITEMS ARE MADE SPECIAL TO ORDER AND MAY NOT BE RETURNED FOR SIZE EXCHANGE OR FOR REFUND. PLEASE BE SURE TO ORDER THE CORRECT SIZE. There is a sizing chart on the page of each individual item. Please be sure to check that sizing chart before ordering. Some items (but not all items) will be available for viewing at Sports & Apparel in Fowlerville. IMPORTANT: All items EXCEPT the women's cut tees and sweatpants include Rider Name or Horse's Name on shirt back. Please be sure to included the correct spelling of the name you would like in the COMMENTS section at checkout. ALSO: There is an option for each item for a GLITTER PRINT or REGULAR PRINT (non-glitter). Each item is set to default to a GLITTER PRINT. Please be sure to change that selection if you do not wish to have the glitter.